WILLEMSTAD - The Curaçao militia is looking for new blood. Young men with a diploma PSVE or SBO-1 may start in August with a new program. They are then trained as a militiaman in 12 months. 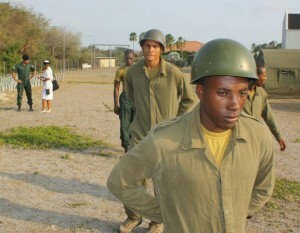 Curacao's militia is engaged in security and stability under the leadership of the Dutch Royal Navy. After getting their education, the militiamen can get a contract of up to four years. Are you a man between 18 and 24, you have the Dutch nationality and you are registered in Curaçao, you can apply. Send an email to ms.toppenberg@mindef.nl is sufficient to request a form. For more information, you can call 005999-4637573. Closing date to submit an application form is March 24, 2017.